"Be an encourager. The world has enough critics." Every school year, many of my Grade One students read the daily morning announcements over the P.A. system in the office. Afterwards, the children return to our classroom amidst cheers and claps and whoops and shouts of "Way to go!" from the rest of us. I am always so incredibly proud of these pint-sized risk-takers. 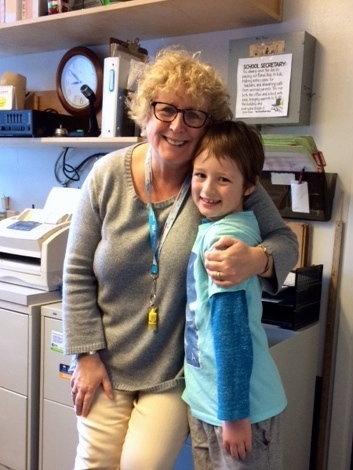 Last year in May, as my Grade One students were clamouring for a coveted spot on the morning announcement roster, I told my students they were much braver than me. And I let them in on a little secret. I told them that I had never ever spoken on the P.A. system. Not even once since becoming a teacher 37 years ago. "Not even once?" they asked. "Why not?" I told them I was too scared. That the thought of it made me nervous. My students looked at me with puzzled expressions on their faces. They couldn't figure me out. Who wouldn't want to do something that was so much fun? I am always yammering on to my students about the benefits of having a growth mindset. So I put my money where my mouth was. And I made a pledge to my students. I promised them that I would read the morning announcements before I retired in June 2017. My plan was to wait until the end of this school year and then surprise everyone with my voice over the airwaves. But I was even unsure if I would have the guts to do it. A former student of mine had his own idea. Early on Wednesday morning I was in my classroom preparing for the day's lessons when my phone rang. It was our school secretary telling me she had Shem in the office and he'd like me to read the morning announcements with him. After some stammering and spluttering and more stammering I said, "Tell Shem I'll be right there." I mean, seriously, how could I turn down his request? I was so nervous. My heart was thumping in my chest. My hand shook as I held the paper. I was worried I'd mispronounce words. Thankfully I only had to read two sentences and Shem deftly handled the rest of it. When we were done, I gave Shem the biggest hug and thanked him for encouraging me to do something I was afraid to do. "You, a 7 year old boy, helped a 58 year old woman overcome her fear! Your encouragement means so much to me. You gave me the push I needed. And you didn't let me do it alone." I will never forget what this child did for me. His act of encouragement is a lesson for us all. No matter what, encourage others.